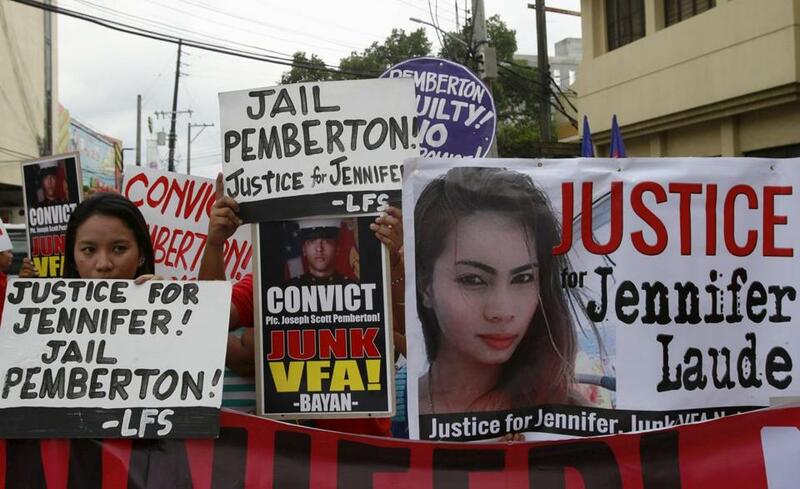 Marine Joseph Scott Pemberton was found guilty in the killing of Jennifer Laude. OLONGAPO, Philippines — A Philippine court on Tuesday convicted a U.S. Marine of killing a Filipino last year after he discovered she was a transgender woman in a hotel while he was on a break after participating in joint military exercises in the country. The court also ordered Pemberton, who has been detained at a Philippine military camp for about a year, to pay Laude’s family 4.6 million pesos ($98,000) in damages. Laude’s mother, Julita, said that while she was happy the verdict detailed everything that had transpired, she was not pleased with the length of the jail term because she had hoped Pemberton would be convicted of murder, a more serious crime than homicide. 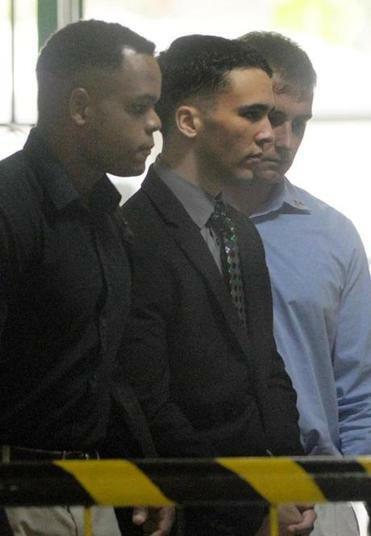 Lance Corporal Joseph Scott Pemberton, 20, of New Bedford, is accused of killing a 26-year-old Filipino in October 2014. The judge said she downgraded the murder charge to homicide because conditions such as cruelty and treachery had not been proven. The killing sparked anger in the Philippines and reignited calls by left-wing groups and nationalists for an end to America’s military presence in the country at a time when the U.S. is reasserting its dominance in Asia and Manila has turned to Washington for support amid an escalating territorial dispute with China. Protesters displayed placards outside a court in Olongapo city. Half a block from the court, dozens of left-wing protesters rejoiced after the verdict was announced by burning an effigy of Uncle Sam and yelling ‘‘Justice for Jennifer!’’ Police officers, fire trucks and iron railings were used to prevent them from getting closer to the courthouse. Lawyers for Laude’s family, however, said Laude was dead when Pemberton left her. Police have said that Laude had apparently been drowned in a toilet. The judge said an agreement between the U.S. and the Philippines was ambiguous and failed to state in which facility within the Philippine military headquarters Pemberton would be detained and which government agency would have supervision. She ordered that he be brought to the national penitentiary, in accordance with local laws, until it is decided where he should be permanently held. Pemberton’s lawyers made an impromptu appeal against him being brought to the national penitentiary. After meeting with the lawyers and government representatives, the judge allowed Pemberton to be detained for five days at the military headquarters pending a permanent detention site, said Roque, the Laudes’ lawyer. 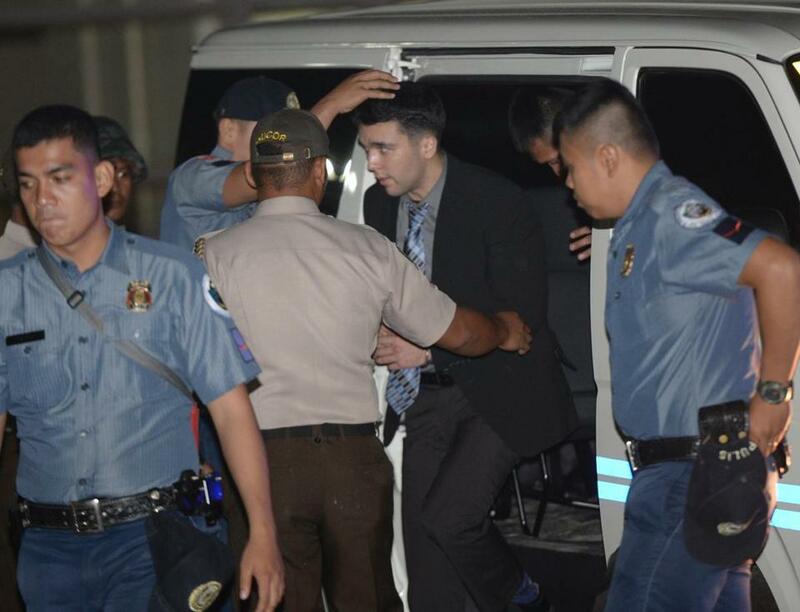 In a compromise last year, the U.S. agreed to have Pemberton detained in a compound at Philippine military headquarters in suburban Quezon City guarded by U.S. Marines with an outer ring of Filipino forces. Left-wing activists and nationalist Filipinos have cited the custody provision of the VFA as proof that the accord was lopsided in favor of the U.S. and undermines the sovereignty of the Philippines, which was an American colony until 1946. 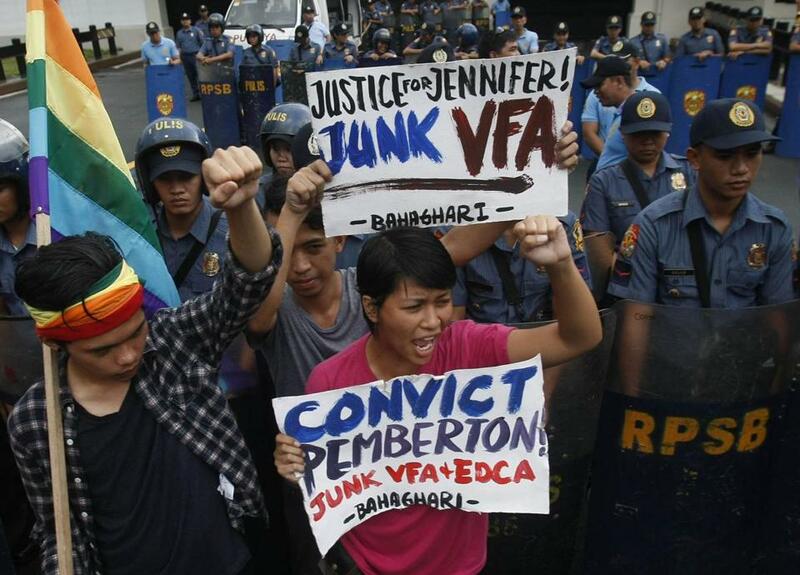 Protesters shouted slogans Tuesday at the US Embassy in Manila as the verdict was handed down. Teresa Cerojano reported from Manila.